As of January 1, 2016 Medicare has now approved billing codes that allow you to receive Advance Care Planning Education & Counseling. This is what has been commonly called End of Life planning or counseling. We at the Institute on HealthCare Directives do not consider this End of Life Planning. Our approach is uniquely different in that we are advocates for your safety. 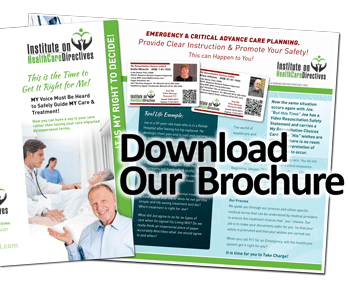 We have created education that encompasses Emergency & Critical Advance Care Planning. We educate you and your family so as to understand the differences between critical illness & End of Life. We want to make sure that when you are critically ill and wish to receive lifesaving treatment that it is performed quickly & effectively. We also want to make sure those medical providers (who do not know you or your goals), do not give up on you prematurely. This Medical Consultation and Evaluation can be through a traditional medical appointment in our facilities or can occur in the privacy of your home through secure and protected Tele-Medicine Services. -Most Major Insurances accepted for the medical evaluation. Your voice as the patient “Should & Must” be heard. Too often though, health care providers, of all types, do not honor and respect a patient or health care agent’s wishes for aggressive treatment or more conservative treatment to allow a natural dying process. The Institute on Healthcare Directives ensures that your voice will be heard & will do so by offering a customized MIDEOTM (My Informed Decision on VidEO) Safety Statement that is quickly & easily retrievable by medical personnel any time, day or night. For those patients or families with more intensive needs or care concerns, we also offer a VIP Concierge Advocate service available 24/7/365. With this service you will always be protected with immediate & real time guidance to your concerns or questions by a physician who has been trained by the Institute on Health Care Directives. You will meet with one of our physicians. You will be educated & counseled according to your individual needs. We will customize your MIDEOTM Safety Statement. We will create or assist you with recording the MIDEOTM Safety Statement. We will proof your customized MIDEOTM Safety Statement for quality & safety compliance checks. We will assure the link with the QR Response Code. We will then review this with you and once we both approve, we will create your customized & personalized MIDEOTM ID Cards. (You will be provided with 2 ID cards). For individuals (For example, those with Cancer, Heart or Lung disease, especially those traveling such as snow birds) who require navigation through the complex medical system who have specific goals to be achieved. Includes the components of the above Vital Package & Storage fees. Includes “Live” Medical Decision Support 24/7 365 days per year with a Board Certified Physician trained by the Institute on HealthCare Directives. – This service can be made to include support for your legally appointed HealthCare Agent. – This service will act on your behalf and will not be biased by institution practices or payer restrictions. For the following year, the service fee decreases and remains fixed unless a new MIDEOTM is created. Includes 2 copies of your MIDEOTM ID Cards. 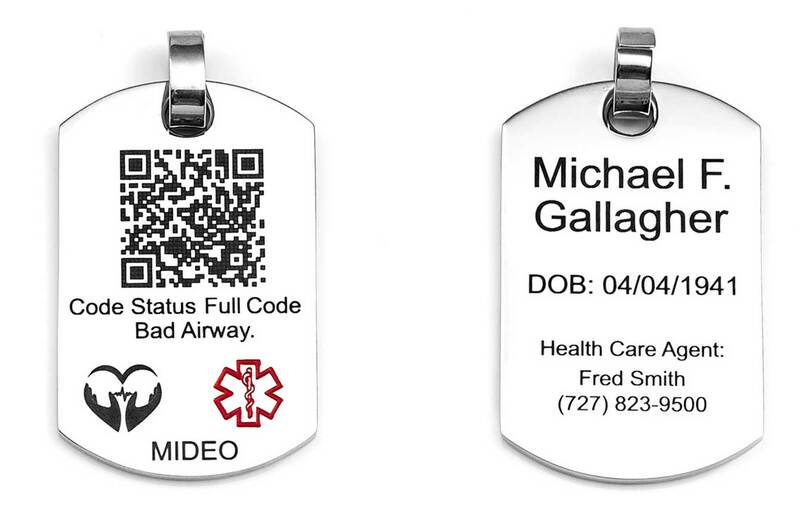 For patients that have been diagnosed with a terminal or end stage illness, but still wish to enjoy life with quality but do not want to risk being treated against their wish, we have developed MIDEOTM ID jewelry. The purpose of this jewelry is for when an emergency crisis situation occurs. The main purpose is to prevent those who do not know you from taking action such as cardio-pulmonary resuscitation (CPR) to keep you alive. MIDEOTM jewelry is uniquely created to prevent these actions from occurring and can be scanned with any type of smart phone to retrieve your MIDEOTM statement. The Institute on HealthCare Directives & Video Directives has partnered with Global Rescue, a leading provider of integrated medical, security, travel risk and crisis response services to travelers worldwide. The reason we have done this is two-fold. Without a Global Rescue membership, an emergency evacuation could cost you more than $100,000. Secondly, and most importantly, if you are one of our patients or clients then you came to us with a reason to protect your safety. If you have health conditions and are traveling in the USA or internationally you may be at risk to receive medical treatments that could end your life prematurely or extend your life against your wishes. If you are traveling internationally, the risk to you would be not receiving medical care that would save your life. This situation is real, happens every day and is not something you are aware of. The reason this risk happens in other countries is that the medical systems of other countries are socialized and they ration health care. This means they can decide if you receive the medical care and live or don’t and die. In these countries you need a process that is aligned with your MIDEOTM Card to come in and quickly evacuate you and your family back to the United States. The benefit of Global Rescue is that we trust them to get you home safely when the worst happens. Global Rescue’s critical care paramedics and military special operations veterans are standing by to give members immediate access to medical and security experts and unparalleled deployment resources. With Global Rescue’s relationship with John’s Hopkins Emergency Medicine Division of Special Operations Medical System, they can provide the necessary lifesaving medical therapies as soon as they arrive on scene and continue these treatments until you safely arrive home to receive medical care in the hands of the doctors who know you and you trust. So whether you are a healthy person over age 45, a recently retired traveler, or have been diagnosed with a condition that has caused you to want to complete a bucket list of traveling, MIDEOTM will provide the medical direction you require to begin your treatment and Global Rescue will ensure you get home safely into the hands to the medical teams that you trust most!